The new musical playground equipment, designed and crafted by Kim Bowman has been a magnificent addition to our school playground. 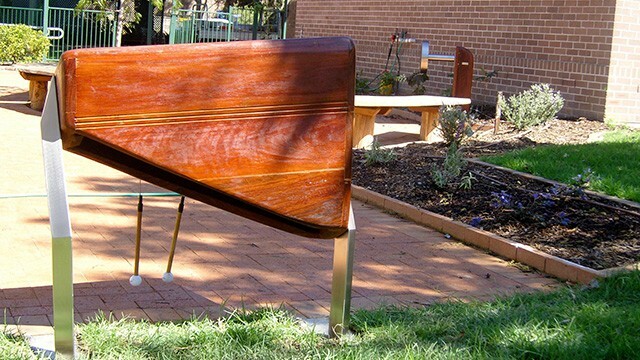 These beautifully crafted outdoor instruments really engage our students and hold their interest. They are able to engage with the marimba and rainwheel independently which then sustains their attention meaning that they don’t always need adult assistance to enjoy the resulting sounds. The marimba has proved to be very popular with our students. No matter how you strike it, you get a lovely melodic sound that actually sounds like music! It’s a delightful sound to have emanating from our playground. Some students who regularly throw most objects away actually keep hold of the strikers so they can continue making these lovely tunes. The rainwheel is very simple for students to turn and although a quieter sound, is equally appealing to many of our students, as they see the wheel spin and hear the gentle sound, which is also very motivational. We are delighted with these 2 new pieces of play equipment.